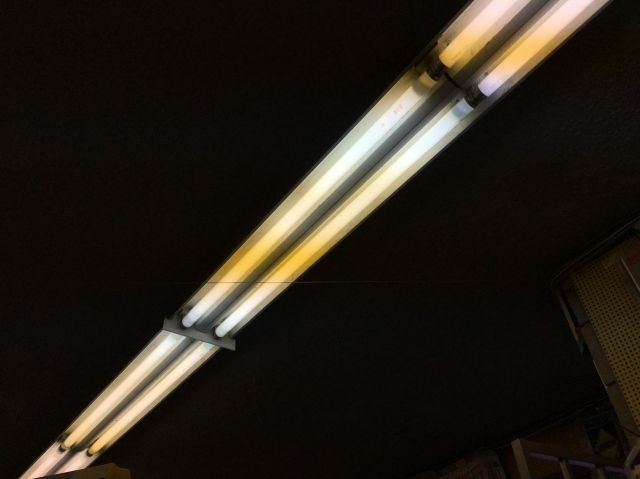 Lighting-Gallery-net - Fluorescent - T-12 and larger/Ever seen a GE Ecolux F40CW? Halophosphor cool white. Ever seen a GE Ecolux F40CW? Halophosphor cool white. F40CWs with protective coatings are exempt! So there are GE Ecolux F40CWs. This pair is how a current GE F40CW looks like. End band and all. Also lots of Thai made Damars. Cool...these look similar to a bunch of eco GE /Shop version I installed at work. I put them in both full power RS and a preheater. Some are banding already while others have dark patches. The preheater one has huge bands, lol. I've seen these lamps too. I wonder if they're STILL exempt after 2012, which as far as I know killed off the halophosphor cool white 25w "shoplight" F40s, or at least Sylvania's 25w 4' T12s are now CWX. Can anyone confirm this? They're still made today. They are export lamps, with the shatter resistant sleeve put on. Yeah, occasionally the 'Export' lamps still end up here LOL. The Thai made Damars end band nicely. Is it possible to remove the protective coating without damaging the lamp? Yep. Nothing more than an impact resistant plastic coating heat shrunk to the end caps. Viola, you got a GE Ecolux F40CW made in 2013. The blackening almost looks like a "3" from the early 60's.